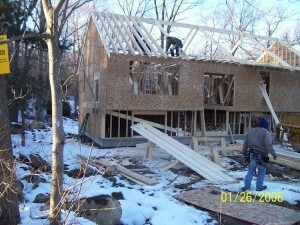 Modular homes are built in a factory and assembled and completed on a prepared site. They are built using the same materials and equipment that conventionally constructed homes use but in a controlled factory environment and with much greater speed. These homes are sometimes referred to as prefabricated or prefab homes as well as manufactured homes. The industry usually reserves the term “manufactured” for HUD housing built to a lesser standard and set on a metal frame. We at Mod-Tech Homes think of this method of construction as “system built” since factory methods and systems are utilized. 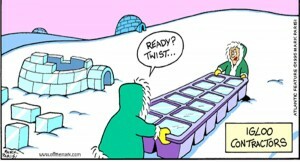 These Eskimos have a system. Factories provide us all with higher quality products and at a lower cost. An example of this is our automobiles. Imagine if all the parts of a car were dumped in your driveway and a dozen mechanics were sent to assemble it a piece at a time. The cost of buying individual parts and paying all those mechanics would be exorbitant. The time it would take and the disruption to you and your neighborhood would be unacceptable. We would not consider buying a car that way so why do people build houses that way; a piece at a time and outside in the weather for months. There are different types of system built products for residential construction but modular production provides the most complete product and great value. Advantage 1: Being built inside a factory protects the workers and the materials. Bad weather not only damages the materials it makes the workers cold and uncomfortable. Plus it causes delays adding time to what would seem like an unending process. Inside the factory work can continue around the clock and in comfort. As an example; a 2,500 square foot, four bedroom colonial with a two car garage can be out the factory door and 90% complete with cabinets, flooring, fixtures, etc. in 3 to 5 days! Advantage 2: The individual modules are shipped to us over the highways and we are going to lift them with a crane to place them on a foundation. The modules have to be built stronger to withstand the stress. FEMA studies after hurricanes in Florida determined that modular homes suffered significantly less damage. 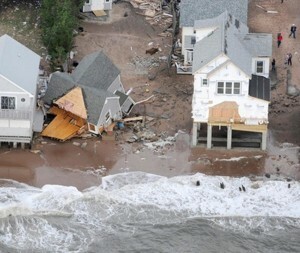 Hurricane Sandy knocked down the site built house while the modular remained standing. With that strength comes greater energy conservation. The homes are tighter and more insulated. 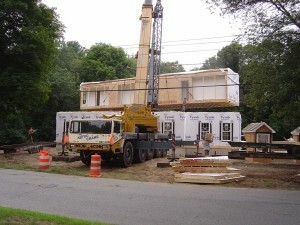 A modular home weighs 30% more than the same size site built home. Also, the lack of waste and efficient processes means green scale construction. Advantage 3: Modular homes are completely customizable. Any size, shape, upgrades and materials are available. We can even convert your current drawings or pictures to 3-dimensional modular designs. Want to learn more about Modular Homes? Get the answers to all of your questions with a simple email or phone call.